When food is scarce, chaos and fear begin to set in. Instead of panicking, step outside and go for a walk and more than likely, food will be right under your nose. In a previous article, “What To Do When There Is No Food,” it was discussed that Mother Nature provides food – a person just needs to be resourceful enough to find it. Food such as tree bark, and insects are definitely on the lower priority for food sources, but when nothing else is available, it may look tempting. Not listed in the article were edible flowers and weeds that are in nearly every backyard. Normally, these food sources are seen as more of a nuisance than a survival food, but in times of need, they can provide much nourishment (and may taste better than eating insects) . Naturalist Steve Brill sheds some great insight on foraging for food. He emphasizes how much food there really is, we just need to go out and find it. Here are a few examples of the most common types of wild food available to many of us. Dandelion – The flower, leaves and root of this plant are edible. This plant has an abundant source of Calcium to aid in bone health and also has properties that help disinfecting lungs. Vitamin A is also present in this plant which acts as a natural antibiotic. The leaves, especially are packed full of every vitamin imaginable. This plant is extremely versatile. The plant can also be made into a tea to alleviate skin irritations such as athlete’s foot, scratches and some acne . Collect the root in the late fall to early spring and makes a great addition to soups or by it self. Dandelion flowers can be eaten raw, sauteed, steamed, fried or used to make wine. 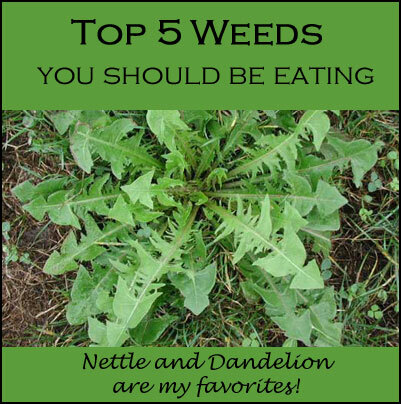 Collect dandelion leaves in the spring when they are most tender and saute them or use in salads or teas. Tear six dandelion leaves into a hot cup of water and let it steep 5-10 minutes. *Any unwanted tea can be used as a natural face wash.
Chicory – This plant is rich in vitamin A, B, K, E and C, calcium, copper and zinc and phosphorus. Collecting young plants in March and in November is the best time to harvest. The flowers are stems can be used in salads. The root can be eaten (after being boiled) or used as a coffee substitute, if necessary. Scrub the Chicory root, chop it up and toast them at 350 degrees for one hour until dark brown, brittle and fragrant. Grind the root up and mix 1 tsp. of ground roots in one cup of hot water. The chicory coffee tastes like bitter coffee. Cattails – Cattails shoots provide essential vitamins such as beta carotene, niacin, thiamine, potassium, phosphorus and vitamin C. Many survival sites view the cattail as one of the most important edible plants to know about. The shoot of a cattail tastes like a combination between a cucumber and a zucchini. It is advised to harvest plants after a bout of dry weather, so they are easily accessible. The entire plant (flowers, shoots and pollen) can be harvested, so cut the plant at the base. The best time to harvest and eat these plants is just before spring when plants are young and just beginning to flower. The older they get, the more fibrous they become. The pollen from cattails provides great energy, nutrition and can also be used as a flour for breads, or breakfast breads such as pancakes and muffins. Although the pollen does not rise, so it should be mixed with three times as much whole grain flower. Or sprinkle it on salads, oatmeal or yogurt. Amaranth – Amaranth once ignored and thought as a pestering plant, is now getting the notice it deserves. Ancient Aztec civilizations thought this plant had superpowers. This plant is high in fiber, amino acid, essential nutrients, and proteins and comes in a close second (quinoa comes in first) with the lysine content. Whole bread can be made from ground amaranth seed. Substitute 25% of your wheat flour with Amaranth flour. According to sources, just 150 grams of the grain is all that is required to supply an adult with 100% of the daily requirement of protein. This plant can be used as a spinach substitute eaten raw or cooked. The leaves are best collected in the spring. Amaranth seeds can also be fermented into beer. Milkweed – This versatile and useful plant has many uses. Not only does it attract butterflies to feed on it and assist you in the garden. But you can also collect the milk, eat the silken fibers from inside the immature pods and use the milkweed fluff as a stuffing for coats or blankets. Milkweed stalks have a fibrous material that can be used as twine for sewing. In more ancient civilizations, Milkweed was eaten as a vegetable. It’s shoots resemble eating asparagus. Flower buds can be collected in the spring time for a broccoli alternative. Flowers can also be boiled and mashed to create a unique sauce. Additionally, the flower pods can be pickled for winter months. Milkweed provides a multitude of edible parts from late spring until late summer. Tess Pennington is the author of The Prepper’s Cookbook: 300 Recipes to Turn Your Emergency Food into Nutritious, Delicious, Life-Saving Meals. When a catastrophic collapse cripples society, grocery store shelves will empty within days. But if you follow this book’s plan for stocking, organizing and maintaining a proper emergency food supply, your family will have plenty to eat for weeks, months or even years. Information. A healthy diet is always best, especially when disasters strike. Knowledge is key. My credit card will not be available for a least another month and I still want to purchase something from this website. I want to be able to locate it again. Can you help me? İzmir ilaçlama Hey there! My name is Chipp Marshal. In this article I am going to show you how to rid of ants quickly, naturally and permanently with an amazing new technique I just learned. Good info, just wish there would be some pictures of these plants.